Lock in a great price for Dolphin Sunrise - rated 9.4 by recent guests. There was a problem with Dolphin sunrise when we arrived so Tanya arranges another place for us to stay. It was enormous and very comfortable and had the most incredible views. This place is absolutely incredible. The house, the view, the rooms... everything is absolutely stunning and we will come back for sure! A big thank you to the house manager who did everything to make us feel welcome and even let us use the terrace after our check out. The house and the location are amazing! The beach is perfect for surfers, not to swimmers or if you like to take a bath because is just in front of the rocs, but you can make a walk not too far to beaches that don't have rocs. But that is THE MUST beach from Jeffreys Bay. Everything was great, the owners are very nice and helpfull, the rooms spacious and clean, and the breakfast was amazing. The bed is very very confortable, and what a view! Even from the bad! And from anywhere you are at the house, actually. What a super experience for our honeymoon. Unbelievable house with luxury furniture and amazing views. Phantastic Location with beautiful view to the Ocean! One of our top picks in Jeffreys Bay.Featuring modern finishes, Dolphin Sunrise is a well-equipped, self-catering home located in Jeffreysbay. Set directly on the beach, the home has large viewing decks to enjoy the panoramic views. Guests receive free WiFi access and use of a fully equipped shared kitchen and shared lounge with a dining area. Each room has a balcony with sea views and offers satellite TV and a coffee machine. Daily cleaning services can be arranged on advance request. Guests at Dolphin Sunrise can enjoy hiking and fishing. There is a garden and barbecue facilities. The property offers free parking. Port Elizabeth Airport is one hour's drive away, and the Gamtoos River Mouth Local Nature Reserve is 24.2 miles from the guesthouse. The Jeffreys Bay Golf Club is 1.9 miles away. 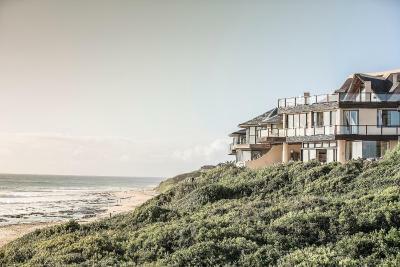 This property also has one of the best-rated locations in Jeffreys Bay! Guests are happier about it compared to other properties in the area. Dolphin Sunrise has been welcoming Booking.com guests since 12 Dec 2014. When would you like to stay at Dolphin Sunrise? This double room has a balcony, flat-screen TV and fireplace. This double room features a terrace with sea view and a dining area. The private bathroom is fitted with a shower. Separate from the main house and located 50 metres from the beach, this self-catering cottage has a balcony and well-equipped kitchenette for guests to prepare their own meals. This family unit features a seating area and sea views. Please note that there is a spiral staircase leading to the entrance of the room. This double room features a fireplace. House rules Dolphin Sunrise takes special requests - add in the next step! A damage deposit of ZAR500 is required upon arrival, which is about GBP27.34. This deposit is fully refundable during check-out as long as there has been no damage to the property. Dolphin Sunrise accepts these cards and reserves the right to temporarily hold an amount prior to arrival. Please note that guests arriving after 18:00, on the day of arrival, may be subject to a late check-in fee. A damage deposit of ZAR 500 is required on arrival. That's about 27.34GBP. This will be collected as a cash payment. You should be reimbursed on check-out. Your deposit will be refunded in full in cash, subject to an inspection of the property. Please inform Dolphin Sunrise in advance of your expected arrival time. You can use the Special Requests box when booking, or contact the property directly with the contact details provided in your confirmation. Did not like to share kitchen. That this is close to the beach. Fantastic location and house! Terrace with BBQ and plenty of space, chairs and tables. Breakfast should be included, considering the price we paid. But we knew it wasnt since the beggining. If you are unlucky and stay at the house with other people you may not like, you might have a bad experience since you are actually sharing very nice place. We arrived at 8pm and had to pay 100 Rand for each hour after 5pm!!! As we arrived by plane, there was no chance to get in earlier. Room itself was expensive already. In addition we did get the room directly at the terasse where everybody was able to look in our room. Great view from the terasse. Very clean.